Quantum physics says that our vacuum is filled with vibrations (Rudra) of Energy (Shiva). These vibrations can exist at a high energy level for a moment and be at a very low level another moment violating law of conservation of energy. At specific energy levels, these vibrations can manifest particle pairs (quarks, antiquarks, leptons/anti-leptons) which the Universe is made of. Quantum physics says things can get created and destroyed without a cause. It says a specific ‘cause’ may not preceed an effect or every effect may not have a cause (it could be probabilistic, random). There need not be any harmony in the Universe. For eg. a Higgs vacuum decay can destroy Universe for no reason, far beyond us. Cosmologists who study Universal evolution, spacetime, gravity and relativity predict that the ponderable Universe is a projection of something imponderable behind it. They predict this projection is time-bound, changes state ever and could end up expanding or dissolving. Standard Model of Universe says the Universe is comprised of Energy and Matter. These could be of the forms of matter, dark matter and dark energy. Matter is visible as it interacts with other forms of matter. Dark matter is invisible as it does not interact. Dark energy is characterized by motion. 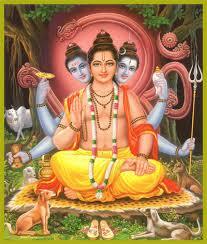 In Tripura Rahasya Dattatreya is trying to resolve all these various philosophies. So Dattatreya offers this view in Tripura Rahasya. He says “It is in its entirety and all its details, a picture on the screen of His Self like the dream world on the individual consciousness. (The Universe is ’s dream of that consciousness). Any individual encompasses his own creation with his ego (as ‘I’); so does the play with the universe (by that consciousness). Just as the dreamer is not to be confounded with the dream so is the (consciousness) not to be confounded with the creation. Just as a man survives his dream, so does the (consciousness) survive the dissolution of His creation. Just as you remain ever as pure consciousness apart from the body, etc., so is the , unbounded consciousness apart from the universe, etc. Tell me of any place where there is no consciousness; there is no place beyond consciousness. Or can anyone prove in any manner anything outside consciousness? Consciousness is inescapable. O Parasurama! Note how daydreams and hallucinations are clearly pictured in the mind even in the absence of any reality behind them. How does it happen? The place of objects is taken up by the peculiar imaginative quality of the mind. When such imagination is deep, it takes shape as creation; consciousness is pure and unblemished in the absence of imagination. Thus you see how consciousness was absolute and pure before creation and how its peculiar quality or will brought about this image of the world in it. So the world is nothing but an image drawn on the screen of consciousness, it differs from a mental picture in its long duration; that is again due to the strength of will producing the phenomenon. The universe appears practical, material and perfect because the will determining its creation is perfect and independent; whereas the human conceptions are more or less transitory according to the strength or the weakness of the will behind them”. Does this view of Dattatreya that says Universal matter and life are simply ephemeral fleeting thoughts of some pure consciousness that exists apart from it, like thoughts of a brain has an equivalent in science (like Carvaka, Samkhya, Vijnana maargas having parallel with Quantum, Cosmological and classical physics)..? Well not really and not fully. But science suspects Quantum world and consciousness have similar workings and are proposing several theories. One is quantum mind. There is a lot more we need to discover before we verify if Dattatreya’s averments are true or simple philosophizing. Currently these are vague theories. But unlike what Dattatreya says these philosophies of Carvaka (Quantum), Vijnana (Cosmology, Classical), Samkhya (Standard model) could indeed be mutually compatible with model of consciousness that Dattatreya talks about. That is, if indeed science finds a definition of consciousness and evidence of Universe operating as manifestation of that consciousness, that model would definitely be compatible with other scientific models of the day. As of now, I don't know of any established scientific approval for consciousness theories. Currently it is definitely in the realm of psuedo-science. Ofcourse several investigations are going on. But at times certain journals either misquote or talk about non-validated theories as facts. There are two possibilities that people mistake as proof of consciousness. We become what we think. This impact is in our body. This does not prove we can imagine things and they become external realities. Second is, in quantum physics, unless we measure, the state is indeterministic. In other words measurement only introduces the determinism. This is in a way 'reality depends on our observation'. But that is the nature of quantum physics and has nothing to do with consciousness. So, in my view, we still have a lot more to learn to check if averments of Dattatreya are true. We are not yet there. Viswamitra creating alternate universe is cited as an example of ability to conjure up external realities based on consciousness. Viswamitra does a Yajna to create alternate universe according to Ramayana. In vedas and puranas the Universal evolution of matter (Big Bang) is called a Yajna. For eg., the cosmological constant that is supposed to represent dark energy being so small compared to vacuum energy of universe, has been used to predict multiverses. That our Universe had a Big Bang energy explosion indicates that behind that Big Bang is a huge amount of energy. That energy could be spawning several Big Bangs and several Universes and not just ours. In my translations of Rg Veda I translate mitra as Quark-pairs (Cooper pairs). Visva-mitra simply means Universe's Cooper pair. That's why mitra is used to denote a friend who is like our 'cooper pair'. I am not saying 'consciousness' theories are wrong. I am saying from science perspective, these can be described even without consciousness. But it is highly possible future science can find such things. Let's keep an open mind. In the discussions between Ashtavakraa and Janaka, Janaka says (from my understanding), Light source is the consciousness, Mirror is the intelligence and then there are objects seen in the mirror. The light source independent of mirror or objects is supreme consciousness. Mirror which is intelligence cannot reflect the objects without the light from the light source. Light source in itself also cannot reflect the objects. The light in the mirror is the self-consciousness. Mirror is intelligence. The objects reflected in our intelligence are the worldly objects.